Downloading our ebooks is simple. 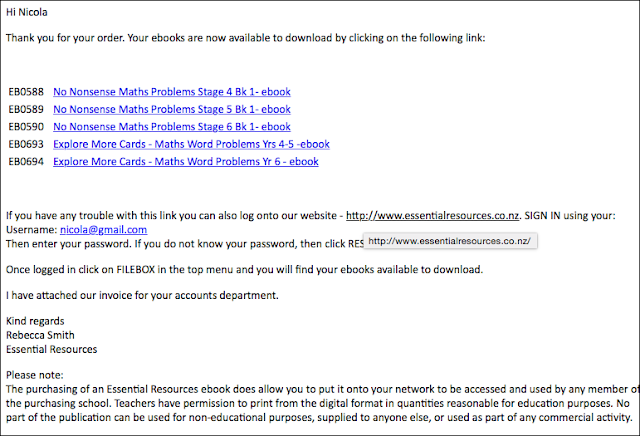 When you purchase ebooks from us, you will receive an email that includes quick links to download them. These links will expire if not used within 2 weeks or if they have been partially downloaded. If that happens, you can always find a copy in your FILEBOX. Simply go to our website and click on SIGN IN. Once you have logged in, click on FILEBOX in the top left menu. In your FILEBOX you will find a copy of all your ebooks. Clicking on each title allows you to download a copy onto your computer by clicking Download PDF File. Save your ebook to a safe place on your hard-drive or school server. Launch Adobe Reader and open your ebook or locate the file and double click on the icon. To download and view your ebooks, you need to have the current version of Adobe Reader on your computer. If you don't have Adobe Reader, click here to get the latest version for free. An ebook is an electronic version of an Essential Resources book you can download to your computer and use in your classroom today. Your computer will have saved your ebook to the place indicated by your computer's browser. If you can’t find it, search for the file using EB + the product code number (which is stated on your account) + .pdf. For example, the code for Awesome Alphabet Activities is 0395 so the ebook has the file name, EB0395.pdf and you would use this file name to search for the ebook on your computer. If, after searching your computer you still can't find it, you can always log back into your Essential Resources account, click FILEBOX and download your ebook again.